It was a calm Friday morning. I was still unsure if I should go home that evening. I had a return ticket for Sunday, but hadn't booked any for going home. I was still confused after I got off the phone talking to mom. I reached office in the morning as usual, and was busy with some work until noon. My afternoon, I had made up my mind to go home that evening. Now, I had to be kidding to decide to go home on a Friday. I logged on to RedBus, and was shocked to see that all the operators had tickets - that too at normal rates! I quickly narrowed down to three options - S.Kallada (my all-time favorite), Shama and RKG. Kallada was ruled out this time - for reasons that I still don't know. I called up my friend to get tickets for RKG - he couldn't attend the calls. A split second decision, and I logged on to the Shama website, and booked a seat for their 10pm Ernakulam bus. I took a print out of the ticket after reaching home. Like everytime, I was late by the time I left home. Had to hurry out - I was at the wheels this time. For some reason, there was absolutely no traffic on Hosur road - Silk Board is usually a big mess on Friday evenings - but this time it was all empty. I reached Madiwala at 2143hrs - the departure time printed on my ticket was 2140hrs! My bus was standing there, outside the Shama office. I rushed into the office - Farooqbhai was sitting there. He handed over a boarding pass to me. It was indeed my bus that was standing outside. So it was KA-01-AB-5582 that night. I was hoping to get the very bus, and thankfully got what I expected. My bus: KA-01-AB-5582. Photo from archives. As I got into the bus, had a look at the odometer reading. Load was quite light - I got into my seat (#14) and got set to sleep. I switched on the GPS in my phone and kept it ready to record the entire trip. The bus got moving at 2201hrs. We stopped outside Angel and then continued. The crew tried getting some pax at St.Johns, but no one turned up. Traffic was quite light all the way - Madiwala market was not as crowded as I expected. We hit BETL in no time. My GPS kept recording around 80~90kmph throughout. I vaguely remember passing Electronic City toll - I slept even before we passed Bommasandra. I vaguely remember seeing the bus running through a two-lane road. I did not realise where we were - later my GPS tracking confirmed that we were going through the interior road off Attibelle to reach Hosur. I had one nice continuous sleep through the night. I vaguely remember seeing a Greenline Sleeper, an SRS seater (non-AC, I guess) and another Shama B9R - I think we were in Walayar then. I suddenly woke up when my co-passenger came and sat down - we were starting from Walayar check-post then - the time was around 0400hrs. I slept off again - the roads felt uneven. I vaguely remember the cleaner shouting out "Palakkad" - the lights weren't switched on - not sure if anybody got down, or what time it was. I continued my deep sleep. I woke up when we hit a good pothole and suddenly turned off the main road - I had no clue of what was happening. Got hold of my spectacles and strained hard to read the boards on the road side - the place was "Pattikad". The bus had turned off the main road and we were taking some small road then. My window had fogged up - the AC was quite cold. As we neared Mannuthy, another Shama B9R (KA-01-AA-2011) tried overtaking us going off the road - that bus came almost perpendicular to ours and almost hit our bus - the driver braked (not very hard), and could feel that the road was too slushy for the bus to stop suddenly - had he braked hard, we'd have skid and hit the other bus for sure. Good response from the crew - really appreciate the drivers' decision not to brake hard. We overtook the other bus at Mannuthy - that bus stopped to drop passengers, while we went ahead without stopping. The bus turned off the highway and headed towards Thrissur town. There was one KSRTC Airavat ahead of us (it was of Bangalore Depot-4 - so guess it was the one coming via Mysore-Coimbatore). By now I adjusted my back rest and searched for my footwear. A family got off the bus at East Fort Junction. I got off my seat as the bus started off from there. Just then, the lights were all switched on, and the cleaner shouted at the top of his voice, announcing our arrival at Thrissur - no wonder, the bus half emptied here. I was finally dropped off outside the District Hospital at 0554hrs - running time of about 7h53m. As usual, none of the autos in the auto stand there wanted to take my short journey - flagged down an auto guy - who confirmed that nobody else was interested before taking me. I was dropped at Sakthan Bus station, from where RNC170 of Irinjalakuda depot ferried me home - ending a multi-axle ride after a good two months, and a visit home after 2.5 months! End Notes: The bus, KA-01-AB-5582 had about 2.59 lakh kms on the odo. The bus was maintained in top-notch condition. The interiors were clean - devoid of any floor mat, but still a very clean floor. Full sized blankets were provided - which certainly helped me have a continuous sleep. The crew were very good - no honking, no rash cuts, no hard brakes. The top speed recorded by my GPS was 103kmph. The bus took the conventional route from Hosur, via Krishnagiri, Salem, Perundurai, Avinashi bypass, Coimbatore bypass, Palakkad bypass, Alathur, Mannuthy. As usual, no movies/music was played, and it was a no-nonsense service. 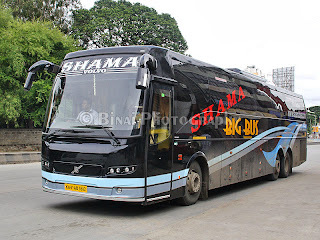 Shama has been impressing me on this route with their good service - my experience with them on the Pathanamthitta route wasn't great, but they've been good in this route. Will I take this service again? Certainly. It meets all my expectations of a hassle free, sleep friendly ride. yesterday saw one "BIG BUS" at Hosur at around 20.30hrs.But the name was "ATLAS".Shama has sold this bus?